Plated desserts always look so much nicer than serve yourself desserts at a dinner party. But plating a dessert after the meal takes away from time you could be spending with your guests. 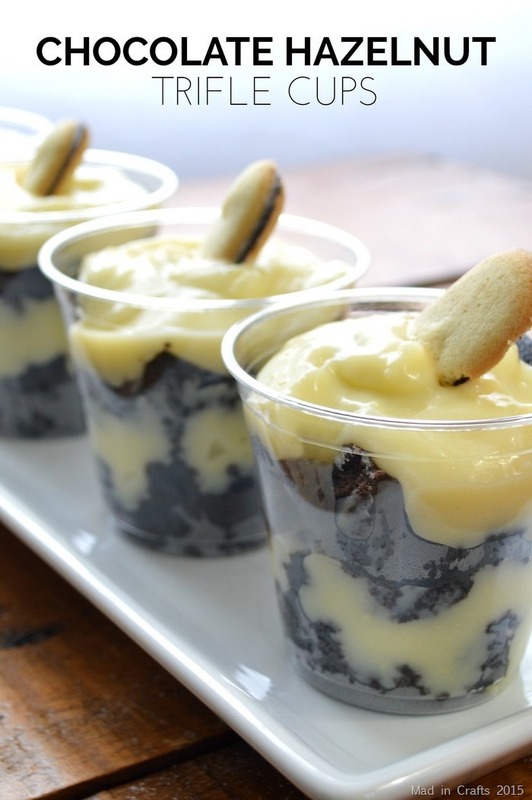 Individual trifles are a great solution! You can plate the trifles earlier in the day, or even the night before, and have dessert set to go before your guests even arrive. This simple trifle is a combination of wacky cake (a Depression-era dessert made with no milk or eggs), prepared pudding, and hazelnut spread. If your friends are as nuts for Nutella as I am, this dessert will be a huge hit. To see how I put this simple recipe together, watch the video below. If you are not already subscribed to my YouTube channel, pop over and click that subscribe button! You will get early access to all my recipes, tutorials, and haul videos. Add flour, sugar, baking soda, salt, and cocoa into an UNGREASED 9x13 pan. Create three "wells" in the dry ingredients. In one well, pour the hazelnut extract, in the second, pour the oil, and pour the vinegar into the third well. Pour water over everything and mix together well. Bake for 25-30 minutes at 350 degrees. Prepare pudding according to package directions. In cups, place a layer of crumbled cake topped by a layer of prepared pudding. Add a dollop of hazelnut spread on top of pudding. Add another layer of cake and pudding. Garnish with hazelnut candy or cookies. 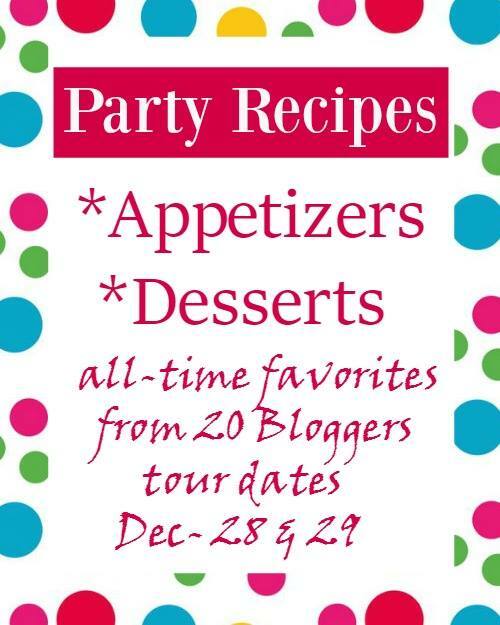 For even more great party recipes, visit the links below. These look great! My kids would love them too!!! Thanks for sharing! These look so fun. I love being able to serving individual cups like this and your recipe sounds delicious! These look delicious and will be perfect for parties! So happy to share the hop with you. Cheers to a Happy New Year! They look tasty! And I love the idea of individual trifle cups… I made a trifle for the tour today too and I think it would be great served in smaller cups too. Thanks for the tip. Hope you have a happy new year! I love Nutella so I know these will be delish!!! I’m a huge Nutella fan so I know that I would like this dessert. For entertaining, it’s nice that you can make this ahead of time and have it ready to serve to each person. Those look yummy! I love the video! 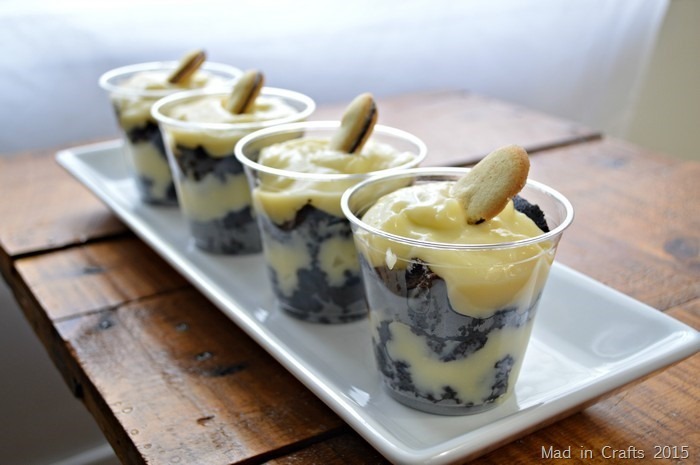 Yum… love desserts in cups! You had me at hazelnut! I love these individual servings. Perfect for party food and so delicious! Thanks for sharing. What a great idea and they sound delicious. Can’t wait to try them.